Request a Quote Today For Your GUARANTEED LOWEST PRICE! Why don't we show our prices online? Our prices are lower than what the manufacturers allow us to advertise online. Rather than post incorrect pricing on the website, we have chosen to leave it off. We know this is inconvenient for you, but if our stores are open, we will always have a salesman available to answer the phone and help you. We also have a team of salesmen ready to respond to the price quote form on this website. Contact us and we'll get you the best deal in the Valley! The new Bertazzoni ranges are superb cooking appliances designed, engineered and made in Italy. All Bertazzoni appliances integrate seamlessly into style-harmonized suites for a true, high-performing kitchen. The high-efficiency maintop with 5 burners features a dual ring 19,000 BTU power-burner that boils water in under 6 minutes (best in class), and 4 additional burners of variable size and power to suit every style of cooking, with delicate simmer at 750 BTUs. 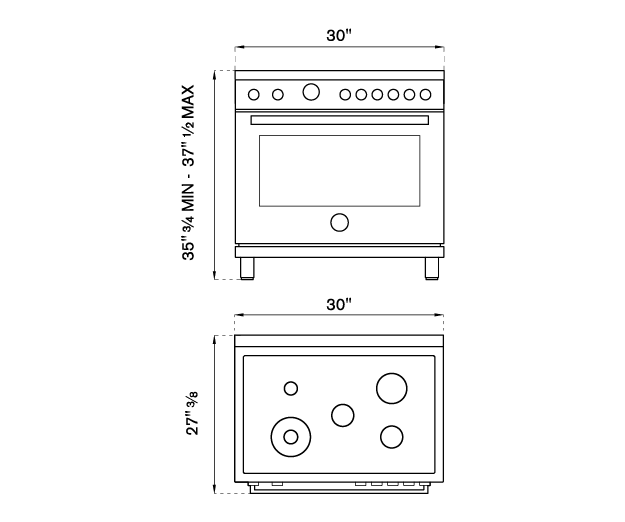 The 4.7 cubic feet oven cavity is the largest in its class, with dual convection fan for balanced airflow and even temperature baking and roasting on 7 shelf levels. The elegant large temperature gauge monitors the actual temperature in the oven. The extra wide infrared gas broiler is ideal for grilling and searing at high heat. The oven includes convenient soft-motion doors. The edge-to-edge interior oven glass door maximizes interior volume and can be wiped clean without effort. All Bertazzoni appliances are covered by a 2-year warranty. Products and packaging are 99% recyclable. 1" stainlesss steel backguard for sleek design and integration into any kitchen.